An assortment of candles for sale made at the Candle Making Workshop in the village of Gourdon in the Provence, France in Europe. The Candle Making Workshop in the village of Gourdon in the Provence, France is definitely worth a visit where you can watch candle making demonstrations on site. 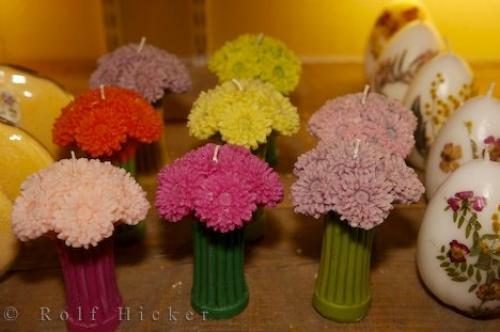 It is very interesting to watch the staff make these candles and the results are phenomenal. All the candles come in a variety of different scents and colors. While at the Candle Making Workshop you can also check out the Old Distillery and La Source Parfumme in the village of Gourdon in France, Europe.Candles for sale (made on site) at La Source Parfumee, Old Distillery and Candle-making Workshop in the Village of Gourdon at 760 metres in the Alpes Maritimes, Provence, France, Europe. Photo of some of the candles created and sold at the Candle Making Workshop in Gourdon in the Provence, France.